Parasol unit foundation for contemporary art is hosting a major solo exhibition of the UCL Slade School of Fine Art's Head of Graduate Painting, Lisa Milroy. The exhibition brings together a selection of Milroy's paintings from the past fifteen years, exploring her approaches to still life through making, looking, touch and transformation. In the 1980s Milroy's paintings featured everyday objects depicted against an off-white ground, compositionally arranged in a grid or random scatter and characterised by a quick gestural application of paint. In the 1990s, Milroy shifted from fast painting to a slower, more modulated approach: she began to paint objects within settings, expanding her understanding of still life to embrace landscape, architecture, portraiture and storytelling. More recently, Milroy's sense of experimentation has led her to explore painting through installation and performance. In Here & There, clothing and shoes are foregrounded, object categories that have defined Milroy's work since the 1980s. On the ground floor, the exhibition focuses on a notion of 'Here' and includes paintings that address materiality and bodily presence through three-dimensional object-paintings, pattern and colour. Some works invite the viewer to physically interact with them, while others picture items of clothing in various states of formation. The installation painting Party of One, 2013, includes a performative component, and performances will take place on a number of weekends throughout the exhibition. On the first floor gallery, the exhibition focuses on 'There' and presents a selection of monochromatic paintings that explore presence and absence, loss, time and memory - all themes recurrent in Milroy's practice. 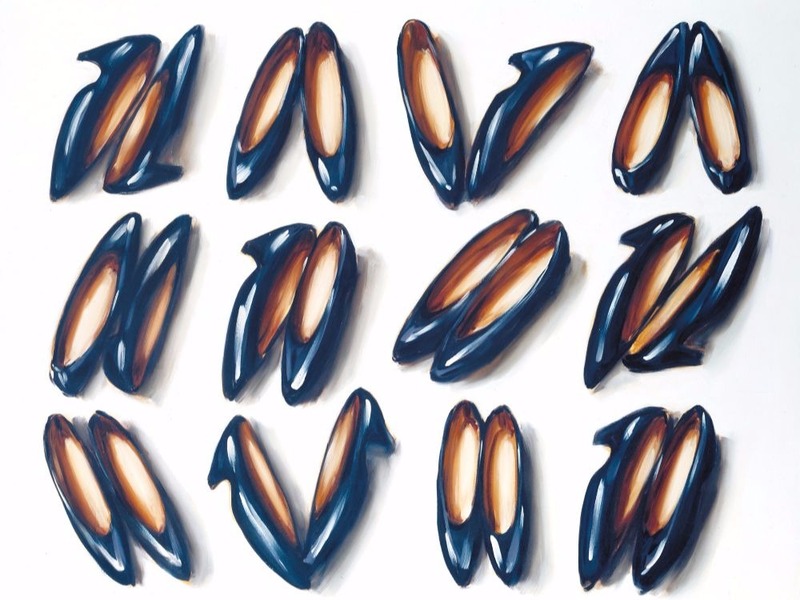 Included is the monumental twenty-metre wide painting Black and White, 2004-2005, based on the artist's studio, and Shoes, 1985, the only work from the 1980s in the exhibition, on loan from Tate and a touchstone painting for Milroy. Milroy was elected to the Royal Academy of Arts in 2005. She is Head of Graduate Painting at the UCL Slade School since 2009, and Guest Visitor at the Rijksakademie van Beeldende Kunsten, Amsterdam since 1995. Milroy won First Prize in the John Moores Painting Prize in 1989. She was Artist Trustee of Tate from 2013 -17 and Liaison Trustee to the National Gallery 2015 -17. Since 2015, she has worked with the Vodafone Foundation's Instant Network Schools where she initiated 'Hands On', a practical art workshop programme that can be delivered through digital connectivity for schoolchildren in refugee camps. Milroy's work is exhibited widely on the international and national stage, and is held in many public and private collections. In early March, Lisa Milroy will also take part in a collaborative exhibition at A.P.T. Gallery in London with Jayne Parker, Head of Fine Art Media at the UCL Slade School. Parasol unit foundation is a contemporary art space and educational charity that operates purely for the public benefit. Every year the foundation organises four challenging and thought-provoking exhibitions by international contemporary artists working in various media. The organisation has a strong focus on public engagement: Milroy's exhibition will be accompanied by an events programme based on her practise. Here & There: Paintings by Lisa Milroy, Parasol unit foundation for contemporary art, January 17 - March 18, 2018. Catalogue available with a foreword by Dr Ziba Ardalan and essays by Hanneke Grootenboer and Briony Fer. Entrance is free. Still Life - Lisa Milroy and Parker, A.P.T Gallery, London. March 3 - March 18, 2018. Entrance is free.